Below are the seven finalists for the Farmers Guardian’s Show Business 2015 competition. The UK’s agricultural shows are an important part of rural life, and a great shop window for the food and farming sector. That’s why Farmers Guardian is offering a media partnership to the winner of this year’s Show Business competition. The winner will receive a media partnership with Farmers Guardian, comprising an official event preview in Farmers Guardian, alongside significant social media support via Farmers Guardian’s Facebook and Twitter accounts and advertising. A reporter and photographer will also attend the show, with a show report and results featuring in Farmers Guardian. Previous winners include Mid-Devon show, Turriff show in Aberdeenshire and Stranraer show in Dumfries and Galloway – but who will be on the roll of honour for this year? Play your part and vote now! Livestock entries: Beef, 173; Sheep, 821; Dairy, 34; Fur and feather, 0, Horses, 682. “Since its launch in 1891 Burwarton show has steadily grown to become a permanent fixture on the calendar for thousands of people in Shropshire, neighbouring counties and beyond. 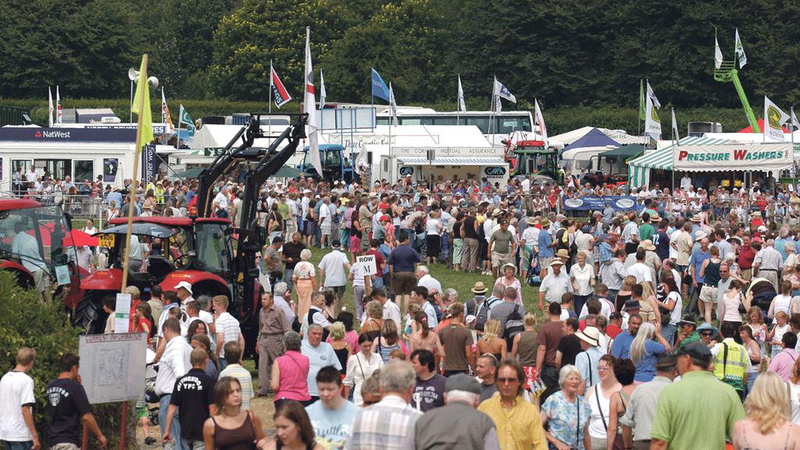 More than 20,000 visitors attend this much-loved event every August and we take enormous pride in the fact that we consider it to be the finest one-day agricultural show in the country. Feedback received from judges, exhibitors and visitors always places great emphasis on the professional organisation and friendliness of stewards and the overall event. So what do we believe makes Burwarton special? While volume, in terms of both entries and visitors, has always been a key consideration, great pains are taken to ensure that nothing compromises quality. We are extremely proud of the high standard of all our exhibits with livestock and horses being of particularly high calibre, not to be outdone by the support we get from the agricultural trade. While we must endeavour to maintain the core values which have held the show in such good stead for the last 120 years, we also recognise that we cannot stand still and we continually need to innovate. The newly introduced shearing competition is a popular addition to the show, instigated and organised by local livestock committee members and ably supported by an army of YFC members. Innovation and education is a theme that runs throughout the show, nowhere more so than in the conservation area where current information on environmental and rural issues can be gathered. Demonstrations of traditional rural skills are also a feature of this area. However, the show simply could not function without the enormous goodwill and dedication of literally hundreds of volunteers from the local community. The pre-show briefing event is always attended by more than 300 volunteers. Burwarton Show is a non-profit making event with any surplus reinvested to secure the future of the event. Our charitable bursary supports young people wishing to pursue education or travel. We also actively support Oak Farm, a local centre for adults with learning difficulties in return for their generous help on Show day with provision of floral displays which they grow on the farm. Livestock entries: Beef, 110; Sheep, 500; Dairy, 80; Fur and feather, 280, Horses, 670. “The Cumberland County Show represents all aspects of farming and rural life within our county and receives good support from farmers and townsfolk alike. Cattle entries consist of a good selection across the breeds and are housed within two large marquees, giving the public an opportunity to view and have their questions answered. Sheep entries have been growing year on year and cover all Cumbrian and Continental breeds. Poor weather has hit our Show for a number of years but latterly two good summers have boosted attendance, with visitors enjoying our new site at Carlisle racecourse, where they can view increased numbers of trade stands, experience local food opportunities with ‘Taste Cumbria’, and a full range of entertainment throughout the day within our large countryside area, main ring, and various other features such as the model farm, dog show, fur and feather and the extensive craft and rural industries marquee. Each year we invest in major entertainment acts, but also rely upon traditional features such as sheepdog displays, terrier racing and the ever-popular Cumberland and Westmorland wrestling. The Young Farmers movement in Cumbria is extremely strong and for a number of years they have helped us in various ways, providing entertainment in the main ring and Countryside area, and are also able to boost their own funds by providing bar facilities within one of our food courts. At our new site we have had a great opportunity to expand our horse section which already has a large number of classifications represented. An enthusiastic horse committee and team of stewards is ensuring exhibitors receive the welcome and facilities appropriate for a county show. Throughout recent years we have forged numerous partnerships, particularly with a number of agricultural businesses. They have seen our show as an important marketing opportunity both by way of sponsorship and exhibiting. Carlisle City Council has been equally been supportive, not only with grants but with enthusiastic involvement of its various teams of staff and elected members alike. Livestock entries: Beef, 178; Sheep, 647; Dairy, 92; Fur and feather, 0, Horses, 492. “Dumfries is an old established agricultural society which amalgamated with Lockerbie Show 54 years ago and is now considered to be the largest one day show in the country. It is a traditional agricultural show held on the first Saturday in August each year. Dumfries, being primarily a livestock producing area, prides itself on the quality of the livestock on display, with the quality of dairy, beef and sheep sections second to none. In 2016, the show is honoured to be hosting a national show for the Galloway Society World Congress. There is a very large and growing horse section with an extensive array of different classes. It has BS affiliation and is a qualifier for the Horse of The Year Show and Blair Atholl. The show has an enthusiastic goat section which includes milking trials. There are also sections for the home and garden industries, stick making, a large craft fayre, a food festival with cookery theatre, and a very popular and growing cheese competition which is the only one in Scotland outside the Highland Show, a young farmers section as well as a huge array of stands throughout the showfield. The show directors are conscious of the need to attract members of the general public as well as those from the farming community. In addition to the attractions above, this year the show will also feature the Pony Club Championship , The Sheep Show, a vintage machinery parade, chainsaw carving, face painters, Daffy Dill and Douglas the Clown, Annan Town Band, a bouncy castle and play and picnic areas. These are a broad spectrum of attractions hopefully providing something for everyone. Livestock entries: Beef, 127; Sheep, 140; Dairy, 73; Fur and feather, 202, Horses, 0. “Fermanagh County Show, held in Enniskillen, is the two-day grand finale to the Northern Irish show season. Organised by County Fermanagh Farming Society, it is the oldest agricultural show in Northern Ireland, now celebrating its 179th year and one of the biggest county events, attracting visitors from across Europe and further afield. The show provides a forum for the general public to view agriculture at its best; the home industries and school sections attract a combined average of 4,500 entries. We amalgamate 192 trade stands (from tractors to handmade cosmetics) flanked by an artisan foodhall showcasing 30 businesses with the best local food alongside demonstrations with local butchers and celebrity chefs. The dogs, rare breeds and pet shows create keen competition and widespread public interest, while the bygone days are not forgotten with a vintage machinery display and parade. The Donkey Derby is a firm crowd pleaser and names such as ‘Hairy Ned’ have quickly become legend in the county! The poultry section is a particular draw for young people; giving young exhibitors the opportunity to exhibit at English and ROI shows. An important aspect is the good natured competition which occurs in the showground on day two when exhibitors arrive at dawn with their pedigree and commercial stock. The main sections end in finales of Champion Sheep in Show, Commercial Champion of Champions, and The Pedigree Interbreed Overall Champion and All-Ireland Dairy Championship for the 1902 Farmers Challenge Trophy. We are privileged to host numerous prestigious competitions such as the Al- Ireland Aberdeen Angus Finals, the British Simmental Cattle Society UK National Stockjudging finals, ISA Beef and Dairy Championships and this year the Final of the NISA Lindens Food Beef Heifer Championship, the NI male and female Simmental Champions, along with the NI Simmental Pairs Champions. Livestock entries: Beef, 90; Sheep, 250; Dairy, 0; Fur and feather, 0, Horses, 175. “The Kenilworth Show is firmly established as one of the most popular agricultural events in the Midlands. The traditional country show has been organised annually since 1944 and attracts on average around 10,000 visitors – making it the largest one-day agricultural event in Coventry and Warwickshire. Its success owes a lot to the dedication and hard work of a band of Kenilworth and District Agricultural Society’s 150 members, who dedicate dozens of hours to deliver a day to remember. One of the most important outcomes of the show for us is putting on a great day which presents agriculture to the public in as an exciting and interesting way as possible - showcasing what rural life and industry is all about. To achieve this mission we put on a packed main-ring programme, complete with a grand parade of livestock, and dedicate a special area which interprets different aspects of farming and enables visitors to experience and touch products, and talk to people that can explain how they’re produced. Attractions which encourage youngsters to consider a career in agriculture are also hugely important, which is why we’ve featured attractions in partnership with Warwickshire College, had the NFU Roadshow with us, along with sheep and Ladies in Pigs shows, which are returning for 2015. Our commentated parade of vintage and modern machinery is also key in explaining to the public how their food used to be grown and how it is done now, in an interesting, spectacular and stimulating way. We are under no illusions how important it is to reinvigorate the show every year, which is why we launched a countryside sports section in 2013. The feedback we’ve had since the launch has been fantastic and we’re growing the area and envisage this being a key feature for many years. This has involved heavy investment. Livestock entries: Beef, 125; Sheep, 600; Dairy, 0; Fur and feather, 0, Horses, 300. “Tenbury Agricultural Society was formed in 1858 and held its 150th anniversary show on a new riverside site to celebrate in 2008. The larger 12ha (30 acre) site has enabled us to introduce a whole new range of features which we have added to and enhanced over the years since. As well as a horticultural and arts and crafts marquee, we now have a large food fayre marquee, playing hose to local producers and putting on cookery and butchery demonstrations. A second countryside ring was added which runs throughout the day and incorporates demonstrations with a rural theme, and we also have tractor pulling. In the third ring we will be once again hosting the NFYFC tug of war finals, which we first hosted in 2013 and were delighted that Tenbury YFC ladies were the winners. The main ring attractions in 2015 are to centre round a grassland demonstration to be put on by show members and supporters, and will also feature a grand parade of livestock to include the 31st national show of Horned Hereford Cattle. New for 2015 in the ever-increasing livestock lines we will be hosting the national Ryeland Sheep show and introducing new sections for Jacob and Kerry Hill sheep. Horses and ponies and Shire horses are also well supported. We actively encourage agricultural trade stands which form by far the greatest volume of stands and which we site in prime positions mainly facing the main ring. We also hold events throughout the year including farm competitions and an autumn show for hops, grains, roots and fruits. In the week before the show we hold a live butchers lamb show and the carcasses are judged and displayed on show day in the national Sheep Association cabinet. We actively support the education of young farmers and horticulturalists by awarding an annual scholarship of £1,000 to students attending a full-time course at college, with £250 to junior students of 16 years. The general committee and sub-committee are filled entirely by volunteers with more than 90% being farmers who give their time to help set up the show in the two weeks before the show day. The local community provide strong support through the turnstiles on the day but, as ever, we are dependent on good weather drawing sufficient numbers of paying public from further afield to guarantee a profitable show.